A method for the prevention and control of mildew. To deal with mildew effectively, just the right amount of evaporated sulphur and a good description of the vapours are necessary. 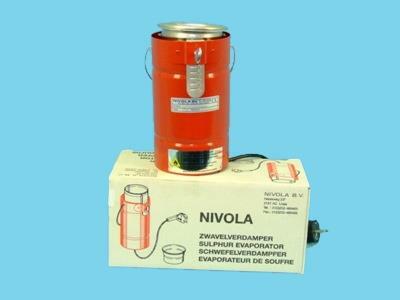 Nivola has specialised in fighting mildew throughout the world for more than 50 years. Besides the moveable Venturion sulphur evaporators, there are the Nivola electrical evaporators which are permanently suspended in the glasshouse and are connected to the power supply. The number of sulphur evaporators for each surface is dependent on the crop. An electric heating element 220 Volt and 100 watt provides for the evaporation of the sulphur. At the same time the heat provides for a natural air circulation which promotes the distribution of the sulphur vapour. A control cabinet with time clock makes it possible to carry out the treatment in the evening when no one needs to be present. If the temperature rises, the chimney effect start working. Sulphur vaporized and spread through the greenhouse. .